I always imagined that the Texas Inaugural Ball probably involved guns and the Confederate flag, turns out I was right! Texas Governor Rick Perry invited his good friend Ted Nugent to rock the crowd at his black-tie inaugural gala. Nugent, being a long time friend of Perry's, happily agreed. What Perry hadn't expected was that his friend would arrive with machine gun props, dressed in a Confederate flag, or that his performance would include "offensive remarks about non-English speakers". GOP strategist Royal Masset had this to say about the decision to let Nugent perform at such a well publicized event, "I think it was a horrible choice. I hope nobody approved it." *That photo ISN'T from the night in question. 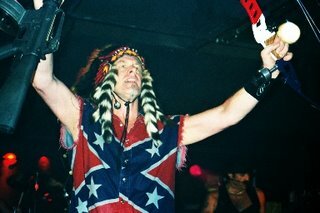 That is from a DIFFERENT time that Ted Nugent dressed in the Confederate flag and brandished machine guns. **Thanks to Dave for the tip. His nickname is the "Motor City Madman", what did they expect? Don't overlook the red, white, and blue compound bow in his left hand... priceless.